Drum Boogie Festival™ is scheduled for Saturday, September 17 (rain date, Sunday, September 18) on the lawn of Cornell Park in the Rondout section of Kingston, New York, from noon to 7pm. The festival is a free event in a comfortable outdoor setting near the Hudson River which coincides with the celebration of the 400th anniversary of Henry Hudson’s historic trip up the river in 1609. Cornell Park was chosen for many reasons including the natural amphitheater acoustics on a multi-tiered hillside overlooking the river. The Drum Boogie Festival is the brainchild of Garry Kvistad, founder of Woodstock Chimes and Executive Director of The Woodstock Chimes Fund, spurred by numerous conversations with New York State Assemblymember Kevin Cahill over a span of several years. 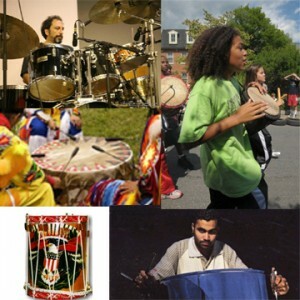 Mr. Cahill, a supporter of the arts and lover of percussion, encouraged Garry to develop a multi-cultural festival, celebrating the diverse styles of world percussion. Realizing that it would be impossible to be all inclusive in a one day festival, Garry selected performers to represent North American drumming in five distinct forms: jazz, modern, rudimental, rock and Native American. He then added representative musical styles from Trinidad & Tobago (steel pan), Bali (Indonesian Gamelan Music) and West African (Ewe style). The poster and logo for the event has been designed by Milton Glaser, one of the most celebrated graphic designers in the world (his “I Love NY” campaign is legendary). The Drum Boogie Festival is a production of the Woodstock Chimes Fund. Created in 1986 by Diane and Garry Kvistad, the Woodstock Chimes Fund is a non-profit foundation to support food, shelter and arts programs in the Hudson Valley and beyond.